Each one has been nothing short of awesome! Pre-IMPACT ceremony we participated in a raffle where Dani Cordon was the name of the winner picked to be gifted a Sky Mermaid Hoodie! I told hostess Ronda Jackson, “Oh my goodness. We can’t give our Sky Mermaid hoodie to a guy.” I almost threw Dani’s card back in the basket to pick another name until Mrs. Jackson said, “Well, maybe, just maybe Dani is a woman, or Dani has a wife, or sister or mother”. Sure enough, Dani ended up being a gal, Danielle. It was a funny moment and was great to actually give her the gift that she’d won fair and square… Moral of the story: never judge a gender by its name! At the ceremony itself I think we were all excited to see Arnice Lamb from Disney be a recipient in honor of the IMPACT she’s had on so many via her strong mentorship and warm strength. When asked to sum up what she hopes we’ll get from her leadership her answer was persistence, and once we’ve learned what we need to learn that we pass it on. Well into my 2nd year with WBENC this is what my experience has been, a community to share my strengths , strong leadership passed down and all laced with massive heart. It’s always so great to be around this sensational group of women. Our booth at the show was right next to Ms. Jackson with Design Decor, which was cozy. We styled the heck out of so many WBE’s. It was a super thrill to fit Pamela Williamson, the sweetheart and beautiful President of WBEC West. She was actually one of our first customers and just nailed it on her first try with an Emery Mermaid midi and topped with the Lori Wrap. 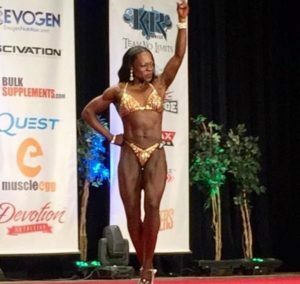 Dr. Giovanna floored and inspired us with her epic proportions and stunning competition physique. Can’t wait to see her flexing that back of her’s in her new Mimi top! Shea Cunningham of SustainableShea, gave legitimacy to all those striving to make their workspace green and environmentally supportive was another awesome light to meet. I want to get her certification! Shea of course got something avocado. Two of the other IMPACT awardee’s, Stacia K. Kato and Rashmi Chaturvedi came by to get fit within 10mins of each other. I was happy that they were wearing fitted midi’s already so the could just try over their clothes. 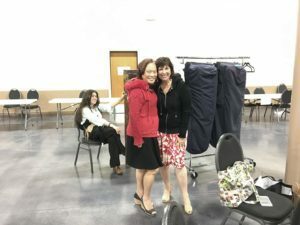 These two received an award together on stage, were both wearing fitted midi’s, and a little later came to learn that they’d both picked the identical pieces too! (same color / same size). That’s a coordinated lunch date in the works! 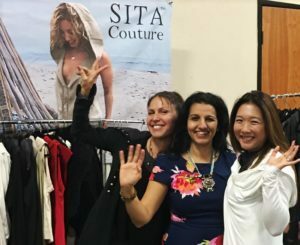 Their styles of choice were: Emery Mermaid midi, Lori Wrap, Lucy Hoodie and Evita midi. 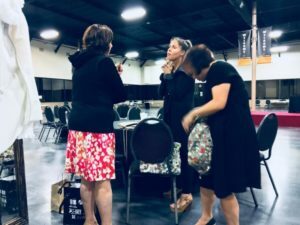 Hats off to Athena Chiera, yet another Lori Wrap recipient, and all of her tribe for the amazing job they did on this beautiful, sweet event, so eloquently produced with tons of class and thought. Very intimate! But none of us seemed to care. 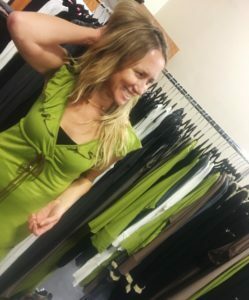 We were all determined to get the right colors and fit for each style that we wanted… regardless of how long it took! I must have opened up the garment bags 10 x’s to find the “right sizes and colors!” It was so funny. I think the fact that nobody was there and we could throw everything everywhere and talk as loud as we wanted to made it all the more eventful. Finally an hour or so later we had it narrowed down, it was difficult but we were all happy with the choices. 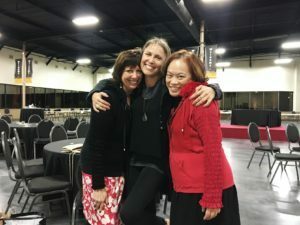 Marianne looking like a queen in the, Lori Wrap and Lucy hoodie and Caron in a red Lucy, Makela and Deep V.
This is how we closed down the 1st WBENC West Winter celebration… In style!! A little more of Lori!